Freshman AJ Smith faced the typical trials of adjusting to life at USF when he began classes in August: meeting new friends, finding his classrooms and adjusting to the academic course load. But unlike most freshmen, Smith made this transition without the gift of sight. Smith is totally blind in both eyes. However, he has adjusted to his life at USF better than many of his full-sighted peers. Though Smith was born legally blind, he was sighted enough to read large fonts and walk without a cane for most of his life, and even drove a car when he turned 16. However, over the course of four months during his senior year of high school, Smith suddenly went from being able to see somewhat well to going completely blind. “It was tough,” Smith said of the sudden onset of blindness. The drastic change was something he was not prepared for, so after graduating high school, Smith spent a year at a school for the blind in the East Bay especially for people who go blind later in life. There they taught him daily living and mobility skills and how to read Braille, though he said it usually takes over 10 years to become very proficient at reading Braille. After spending a year learning how to adapt to his new abilities, Smith was ready to acclimate to life in a university. For the most part, he has not found many difficulties making the adjustment, he said, scratching his head as he tried to think of the most difficult aspect of life at USF. He had no problems meeting new friends. “I’m an outgoing person, so it’s been easy for me,” he said. Finding his way around was also not an issue. He visited the campus regularly before attending classes, and said, “I’ve got the campus pretty much memorized by this point.” He is even able to make it up those Lone Mountain stairs. Schoolwork is where some of the main difficulties come in. Reading from a textbook is something most students take for granted, if not complain about regularly. For Smith, reading from a textbook is not an option; all of his readings must be converted to an audio format or read aloud by a reader coordinated by Student Disability Services. His computer has ample programs to help him, including programs that read him his email and other text documents. However another difficulty arises in becoming involved in extra-curricular activities. Because USF’s website is not compliant with the program that reads text to him, it is often difficult to know what is going on around campus. Also it is difficult getting clubs and organizations to understand how to accommodate things slightly to suit his needs. 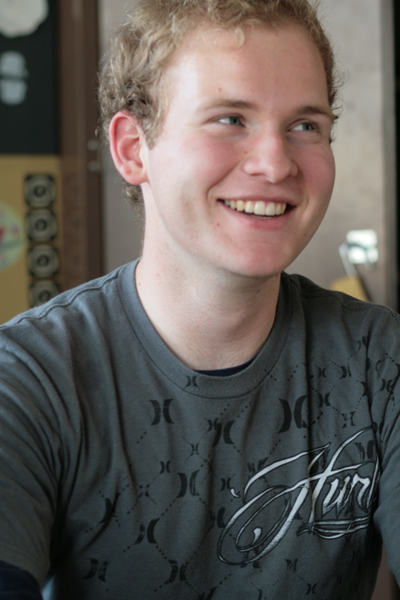 For example, filling out a paper application to run for ASUSF Senate was not possible, but simply by getting an electronic copy on his computer, he was able to fill it out and run for a position. Aside from the usual scholastic and extracurricular activities, Smith enjoys a full calendar that includes time for painting, indoor rock climbing and Argentine tango dancing in the Mission, all unconventional hobbies for the visually impaired but ones he enjoys without difficulty. With this spirit, Smith plans on spending the summer in Argentina by himself, staying in hostels and going out salsa dancing every night. Great article about a great student here at USF! Thanks for this, both of you. A great profile! Mucho Amor A.J.! Nice Job, Laura. AJ please teach me how to rock climb. And oh yeah thanx for saving me in ethics class. ha. You ought to be a part of a contest for one of the highest quality websites on the internet. I most certainly will highly recommend this website!